General assembly antics. Note to self: next time, bring earplugs! Rubbing elbows with more than a thousand teens and young adults--all of whom came together to test their Latin and ancient history/mythology knowledge and socialize? Be still my hammering heart! Honestly, I don't know how I grew up without knowing anything about the Junior Classical League. I would have been all over this when I was a teen. Still, I'm grateful to have experienced a taste of the national convention this week. 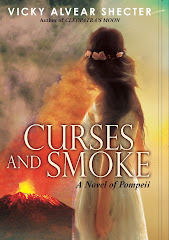 I gave two presentations--one on Cleopatra and one on Writing Historical Fiction. The Cleopatra presentation had to be moved from a classroom at Eastern Kentucky University to a small auditorium. Kelly Kusch of the KY Junior Classical League told me later she counted close to 150 attendees. Kelly, thankfully, stood up to signal me when my hour was over, quickly realizing that I would've gone on FOREVER about my favorite subject. But the teens and teachers had places to go and contests to place! Tenisha of Oklahoma totally captured the Selene smoulder! The EKU bookstore sold out of all my books late afternoon that day. What a wonderful problem to have, right? 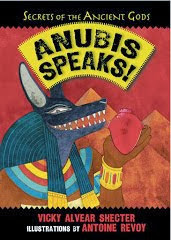 The best part of signing books was talking to the kids about their love of ancient history. 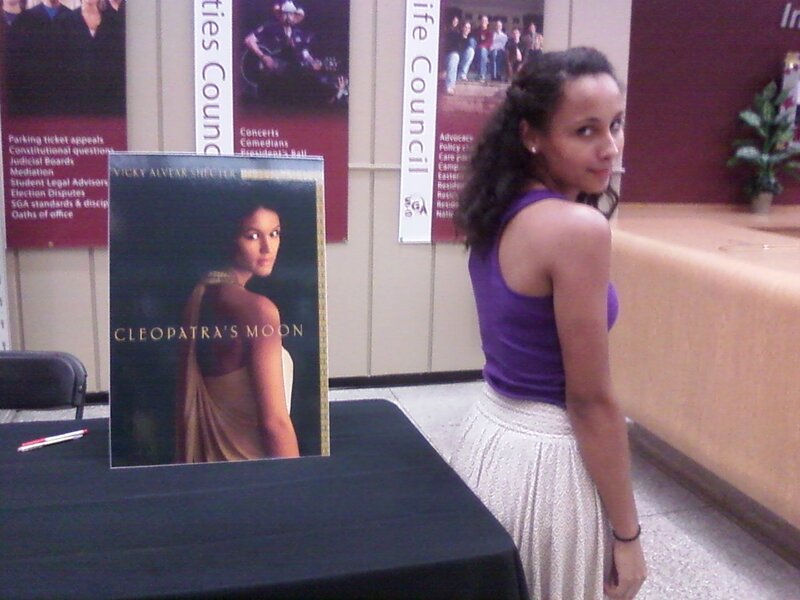 One enthusiastic JCL'er, Tinesha Anderson from Oklahoma, posed as Cleopatra Selene next to the book poster--uncanny resemblance, isn't it? Tinesha has inspired me to start a look-a-like contest. Thanks for the idea, Tinesha! The kids inspired me with their brilliance and enthusiasm but I was also blown away by the dedication of the Latin teachers I met. Wednesday night I was invited to speak at 9:30 pm at a Teacher's Exchange presentation hosted by Davind Volk and Jeremy Walker, both from North Dakota. I was honored to be a part of it. But, to be honest, I thought, "Who's going to show up so late at night when they've been so busy herding, managing, and chaperoning teens?" When I saw the auditorium, I thought David and Jeremy--who are HYSTERICAL by the way--may have overestimated attendance. I figured just a handful of folks would show up. After all, it was late. I was wrong. The auditorium nearly filled with Latin teachers seeking ways of enhancing their teaching methods a. What dedication! I was really blown away by their commitment. And humbled. These are some lucky kids to have such devoted teachers. Me, Shawn, Ginger and Robin (in back). On Thursday night, I joined Shawn Jennings, Robin Simon and Ginger Emshoff--Latin teachers from Texas--at the teachers/chaperone's banquet. Again, I was so impressed by their enthusiasm and dedication to the teaching of Latin and the classics. Plus, they were exceptionally sweet in listening to me share my good news that the LA TIMES had given Cleopatra Moon's an excellent review. I hope to make it out to Texas one day and visit them and their students. I wanted to give a shout-out too to Bari Clemens, a Latin teacher in Kentucky, who was incredibly helpful in making arrangements for me to attend this week. Thank you Bari, Kelly, and everyone else who made it easy for me to be a part of amazing experience. Not to be presumptuous, but I sure do hope to attend future state and national conventions because I'm totally and completely hooked! I'm so so glad you enjoyed yourself with the NJCL. I loved being in it during high school and helping as an SCLer during college. The camaraderie and enthusiasm that surrounds classics was something that definitely drew me to the field. If I hadn't had so much fun with Latin (and GJCL) in high school, I probably wouldn't have gone on to major in college. That sounds like an amazing event! I wish I'd known about it in high school-- I would have killed for Latin, but our district only offered Spanish and French. 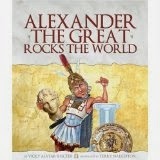 I'm also THRILLED to hear about all the great reviews you've been getting! Congratulations!! It's great to see that Latin is still appreciated by some teenagers. The old philological high schools that offered Latin as first and Ancient Greek a second foreign language are dying out her; usually it's English, French and with luck Latin as well nowadays, and rarely ever Ancient Greek. P.S. 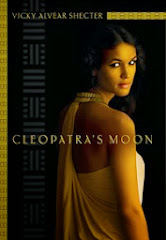 I was so pleased to see a great review in the L.A. Times this weekend of Cleopatra's Moon. Kudos to you!